In 2014, Nibras Khudaida was a 16-year-old Yazidi girl living in the tight-knit, 500-person village of Sreshka in northern Iraq. That area had long known peaceful coexistence among the diverse ethnic and religious groups that, for millennia, had called the broader Nineveh Plain region home. Life’s routines had essentially been the same for centuries. Children received a basic education and married at an early age. Men worked in the fields. Women took care of the family. 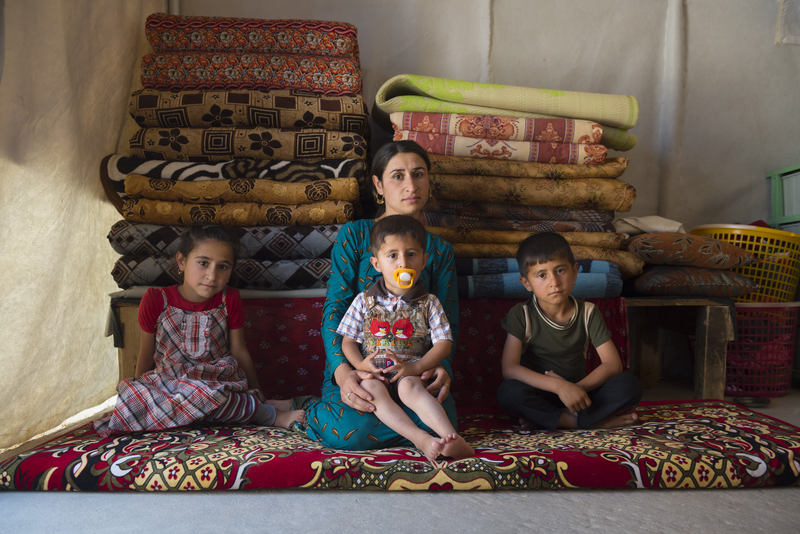 “We knew ISIS was coming, but now they were only two miles from the doorstep of our village.” Nibras’s family only had time to grab their passports and IDs. Ultimately, Nibras and her family ended up in the city of Erbil, where their situation stabilized. But since Nibras’s father had provided logistical support for U.S. forces stationed in Iraq, her family remained on the hit lists of various terror groups. At the all-girls school in Erbil that Nibras attended, she was verbally and physically bullied because of her Yazidi faith. Due to her father’s service to the U.S. military, Nibras and her family were eventually able to come to the United States. Today, she and her family are safely woven into the diverse fabric of Lincoln, Neb., home to the largest community of Yazidis in the United States. In April, Nibras made it to the quarterfinals of the Nebraska State Debate Championship. After her triumph, Nibras cried: “God loves me! God loves me!” Three years ago, Nibras did not speak a word of English, but this spring she delivered a valedictorian address in front of thousands of people at her high school graduation. This fall, she will be the first in her family to attend college—Creighton University in Omaha. Today, there are many Yazidis still trapped inside Iraq who are not as fortunate as Nibras. Some 400,000 Yazidis are internally displaced persons in their own land, too terrified to return to their homes. A little known fact: Some 3,500 Yazidi women remain captives of ISIS. Some 400,000 Yazidis are internally displaced persons in their own land, too terrified to return to their homes. The United States has given so much and lost so much in Iraq that it can be hard to understand why engagement is still necessary. But as beleaguered religious minorities in Iraq hang on for their very survival, the survival of religious pluralism itself is now at stake. Christians in Iraq used to total 1.5 million. Now, only a few hundred thousand remain. Entire villages that thrived for over 1,000 years have been decimated as the indigenous Christian, Yazidi and Shabak Muslim populations fled the ISIS advance. The prospect of continued and unprecedented exodus is real. If this happens, Iraq risks the permanent loss of its ancient religious tapestry. In addition, Iran will continue to expand its influence, permanent refugee camps will likely dot the landscape, migration pressures will stress international aid systems, and ISIS could regenerate. Despite the situation’s fragility, limited progress is being made. I witnessed courageous acts of ecumenical alliance and revitalization in the Nineveh Plain, often with the help of the United States, faith-based entities, and international organizations. As important as aid is to meeting humanitarian needs, to create lasting success an additional security footprint is urgently required in the Nineveh Plain and Sinjar. To quickly meet this objective, I have proposed that we pursue a multinational training mission, in concert with the strengthened forces of the Iraq Central Government and the Peshmerga, integrating local indigenous people. The tandem effect of improved security and a redefined aid package will greatly enhance the likelihood of sustainable outcomes. I was proud that Nibras Khudaida served as an intern in our Nebraska office. When she left for college, she wrote this to me: “I still remember the first time I saw you at the Yazidi New Year. Most of us were waiting for someone to tell us that everything would be all right, someone to give us hope again.” For Nibras, war is not some debate abstraction. She fled for her life. She lost her homeland. And she carries those painful memories with her every day. I embrace there is struggle in all parts of the world with religious diversity. I also embrace that as Catholics, called to protect human life from conception to natural death, does not always go hand-in-hand with American security policies that have troops worldwide engaged in activities that take life from others. I would encourage our politicians to spend more time encouraging humanitarian aid, and less encouraging Catholics toward military / security solutions. The Iraqi Sunnis are being persecuted by the Shia/Kurd government we installed there. Baghdad city was ,prior to our invasion and occupation ,comprised of Shia's and Sunnis as well as Christians. When we toppled the regime, we also ethnically cleansed Baghdad of its Sunni people; i.e., we murdered them all. We prohibited Sunni Iraqis from being in the military, and holding any government jobs.They were excluded from the new government just for being Sunni. How is that for collective punishment?We gave a green light to the central government to persecute Sunnis. Which is what has occurred. After ethically cleansing Baghdad of its Sunnis, the Sunnis Iraqis in other parts of Iraq are now being discriminated against and persecuted by the Shia /Kurd central government. This is why there are demonstrations in Sunnis cities going on. So if it is human rights, equality for all, that motivates outrage at how ISIS treats religious minorities, we should also be calling on the central government to include the Sunni Iraqis as equal citizens of the country with equal rights. Their oppression is being left out of any narrative about religious /ethic persecution. Why their plight is ignored by US media [ in both Iraq and in Syria] as if they are not also a religious group, human beings with rights , deserving protection, exemplifies an anti Sunni bias[imo] Equal rights for all, except if you are a Sunni in Iraq or Syria? I'm a Catholic who has since adolescence in different ways been active in the pro-life movement: education, political, and alternatives -to-abortuon. As I 've lived in a quality nursing home/rehabilitation center for almost three years, I try to put my respect for life views into practice each day by assisting several other residents (one of whom is my roommate and friend) with their personal needs. Although I'm Catholic, my sister-in-law and niece are Presbyterians, several friends are Baptists, I'm a pen pal with a man imprisoned for a serious crime who's a devout Jehovah's Witness. I also know and consolation n the past have worked with Jews and Muslims. Finally, an old friend who moved away is Russian Orthodox, and two friends who visit me are Episcopalians. I certainly support ecumenical efforts to help increase,understanding among different people and decrease the possibility for violent conflict among people of different faiths. I think it's particularly tragic when women are victims of human trafficking, as the Congressman mentioned he's known some women in Iraq who have been victimized in this way. This sadly is an international problem, including in our nation. I occasionally send a modest contribution to a home in Philadelphia that provides shelter and other services to women victims of human trafficking. Although I 'm not a pacifist I respect the courage of their convictions. However, as one who's never served in the military, I also respect the sacrifice of men and women who have been injured or given their lives defending our nation. Imperfect though the United States is, our democratic principles have served as a model for many other nations. I believe that diplomatic efforts should be a exhausted before war is pursued as a last resort. Certainly, it's always seriously immoral to deliberately target/kill noncombatants. Also, the use of nuclear weapons is a terrible evil. Finally, I believe that our nation, other nations, and charitable institutions, including the Church, should redouble efforts to provide humanitarian assistance to the people of Iraq as well as people in other nations in need. This article also appeared in print, under the headline "Defending the most defenseless in Iraq," in the November 12, 2018 issue.